Tearing/rupture of the cranial cruciate ligament (CCL; equivalent to human ACL/anterior cruciate ligament) is one of the most common causes of hind limb lameness in dogs. This article focuses on the above procedure: For further discussion of Cranial Cruciate Ligament disease please see the ACVS website article. There are numerous medical and surgical therapies for CCL rupture, as well as various rehabilitation (“physical therapy”) options. 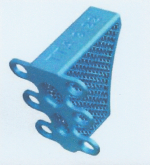 In my experience, patients with surgical therapy recover more quickly and completely than with non-surgical therapy; and patients with bone-altering surgeries (such as TTA/Tibial Tuberosity Advancement and TPLO/Tibial Plateau Leveling Osteotomy) recover more consistently and completely than those with suture stabilization techniques. 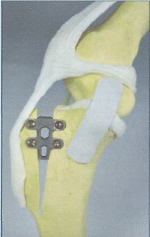 A further modification Tibial Tuberosity Advancement procedure, incorporating the Modified Maquet Technique and using the TTA Rapid implants, is the ideal option in my experience for pets of any size. Please schedule an appointment with our board-certified surgeon, Dr. Jeff Christiansen at the clinic of your choice, to evaluate your pet and to discuss the Tibial Tuberosity Advancement Rapid procedure to improve your pet's length and quality of life.